Open the Spotlight Configure page specific to the template you want to create (for example Configure | Alarms). Any of the following Spotlight configurations can be saved to a template. Select a template or connection that will be the basis of the new template. Click Save as Template to open the Save to Template dialog. You have now created a new template based on the configuration of the selected connection or template. 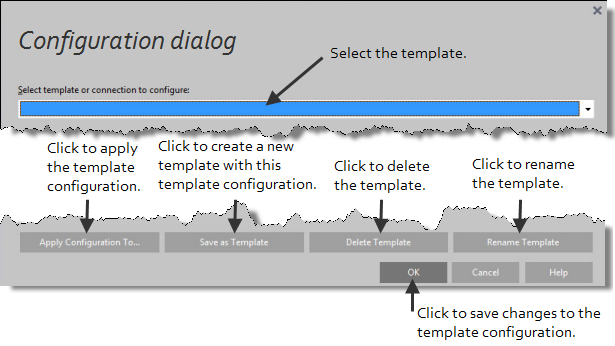 The newly saved template is now selected in the configuration dialog. Any changes you make to the configuration will be applied to this template. Open the Spotlight Configure page specific to the template (for example Configure | Alarms). For an alarm or scheduling configuration, Choose configurations to apply. Select the Spotlight connections to apply the configuration to. For more information, see Select connections. Preview changes to the configuration of the Spotlight connections. For more information, see Preview changes. Tip: The Spotlight Factory Settings Template is applicable to Configure | Alarms and Configure | Scheduling. The Spotlight Factory Settings Template cannot be deleted, renamed or otherwise changed. Select the Spotlight Factory Settings Template to show the Spotlight Factory default configuration.